You remember it being good. Rob reminds you why it isn't. Is there an easier cinematic target than M. Night Shyamalan? 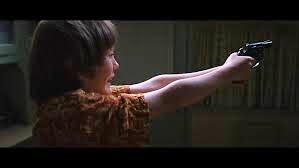 In the years since The Sixth Sense, the writing/directing wunderkind has devolved into a punchline, a name invoked to illustrate a particular film or filmmaker’s hubris and misguided ambition. Once called "The Next Spielberg,” he has now been delegated to for-hire work like the Will Smith vehicle After Earth, which famously left his name absent from its marketing campaign. 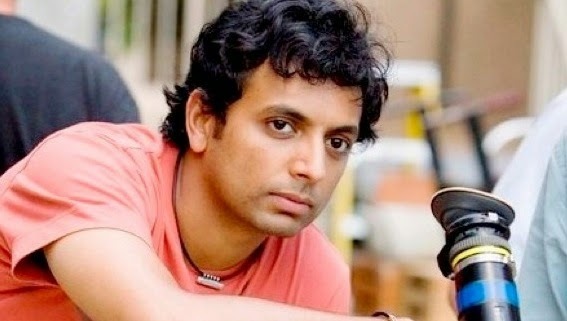 Only time will tell if Mr. Shyamalan will regain his auteur license. I hope he does. Until then, I see no value in beating a dead horse. The man has enough troubles and I don't want to be that writer. However, he has a body of work that is eager and imaginative, and I believe enough time has passed for an honest evaluation of what, aside from the expectation of spectacle bordering on (ugh) Hitchcockian, he actually contributed to our film landscape. Cineastes, wryly rolling their eyes at the mention of The Sixth Sense, often cite Unbreakable as Shyamalan’s true achievement. They bemoan its underrating and the writer/director’s failure to deliver the promised sequel. True, it is an novel idea: Ex-football star David Dunn (Bruce Willis) is the sole survivor of a horrific train crash, which he escaped without a scratch. 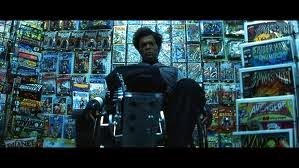 With the help of comic book enthusiast Elijah Price (Samuel L. Jackson), Dunn realizes that he possesses super-human strength and an extra-sensory ability to read evil intentions in the people he passes by. Price believes him to be the long-prophesized Superman, the inspiration for the comic book heroes of his troubled youth. Despite the title, these characters are broken. Dunn is on the downslide of his marriage to Audrey (Robin Wright) and distant from his son Joseph (Spencer Treat Clark). He gave up his football career to satisfy Audrey in the first place; his current work as a security guard is decidedly un-engaging. He seems resigned to his fate. Price, owner of an art gallery dedicated to his comics, is frustrated by a protein deficiency that has made his bones brittle and prone to damage: “Mr. Glass,” the kids used to call him. He believes that he and Dunn share a connection and encourages him to use his gifts for the good of mankind. Dunn agrees, seeing this as a way to enrich his empty life. He dons an ominous poncho and gets to work. Where we go from there, well…that would spoil the fun. It’s hard to see Shyamalan’s films independently; they come in quick succession and often build on similar themes. That said, he’s a director that inspires endless debates over ranking. Which of his films is best? Such debate is useful in it’s own way, but I sometimes wonder if we give poor films a pass because they reflect a marked improvement over their predecessor in a creator’s oeuvre. 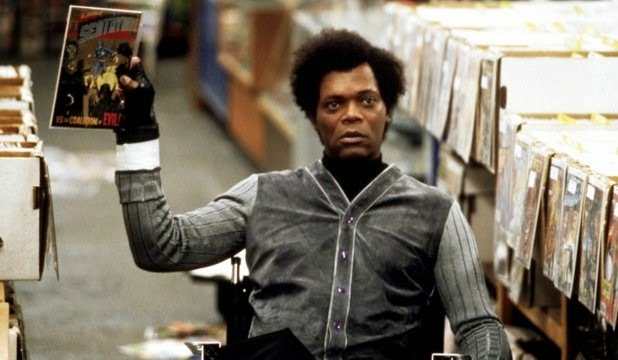 Indeed, most of the contemporary reviews I read in researching for this piece take quite a bit of time explaining why Unbreakable is better or worse than The Sixth Sense. Fourteen years later, it’s time for an objective look. Mr. Shyamalan’s direction only adds to the bizarre awkwardness of each scene. Every single shot draws attention to itself. Rather than shoot proper coverage that would allow the editor to shape tension and intrigue through his cuts, the director chooses to let scenes play out in long master shots that pan and zoom between the actors. This leads to some truly awkward staging. Watch the infamous “No Shooting Friends, Joseph!” scene again and tell me you actually find it tense. Bruce Willis keeps leaning forward as if trying to remember when to hit his next mark. I’ve never seen actors more clearly aware of the camera. Long takes require quality scripts and naturalistic movement on the stage. The actors should control the pacing. It’s how you fill the energy vacuum left when the camera doesn’t cut. Instead, Shyamalan has his actors stand still while he waves and zooms the camera around. It’s less Scorsese and more high school theater. 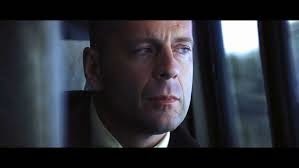 I can't even critique the acting in this film (and believe me, I rarely miss a chance to criticize Bruce Willis) because they likely had very little say in their performances. I should point out that I don’t find the young director (just 29 when shooting took place) at fault for every issue. Like Coppola before him and the Wachowskis after, what Shyamalan really needed was a producer or executive brave enough to reign him in. Think of the ego he must have had (rightfully earned). Wouldn’t you go as far as you could? Again, Hollywood learns the wrong lessons from their successes. I can see the Disney executives secretly meeting with dog-eared copies of the script: “Is this serious?” “He’s the genius, right?” This is how The Happening…well…happens. And I get it. I do. The superhero’s journey. The color symbolism (purple and green, for those keeping score). The poncho that reads “Security” on the back, mimicking Kal-El’s “S.” The symbiotic nature of the hero and villain. And it’s an inspired presentation: Remember, this dark and gritty deconstruction of the caped crusader was half a decade before Batman Begins. But these themes are not properly explored. Dunn realizes he Had The Strength All Along, but what does he do with it? Not much. Things happen at him, sure. So what? 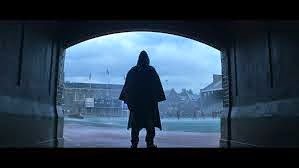 And don’t tell me Shyamalan isn’t going for the Monomyth here. It’s clear enough. But how does he execute the dramatic climax? How does the hero demonstrate his ultimate control over his newfound skills? How does Dunn become the Master of Two Worlds? He has a conversation in the back of a storefront and we’re treated to some expository text before the credits. And I paid $6.50 for this. And yes, I’ve heard the interviews. I know that Shyamalan intentionally focused on the origin story segment of the myth rather than complete the cycle. The problem is that he said that out loud and thought it made sense. The film is only 105 minutes and has no last act. Is this oversight? Is it hubris? Is it unfathomable genius? All I see is contempt for one’s audience. The lack of resolution or development of character is a cop-out, plain and simple. What are Dunn’s wants/needs after he defeats the evil janitor and cements his power? What is preventing him from getting them? Who knows? And don’t mistake my contempt here for the pursuit of formula; there is plenty interesting about defying convention. But these characters are shown to be mysterious and interesting because that’s what Shyamalan’s characters are supposed to be, rather than as a result of any narrative propulsion. It’s now clear that this film rode on the considerable coattails of The Sixth Sense. I guess all those comparisons were justified. 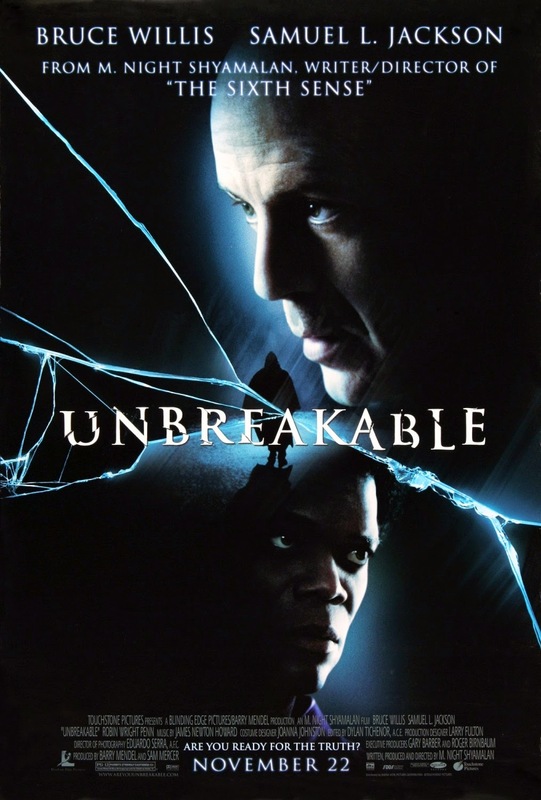 But I’m talking about the long game here, and time has not been kind to Unbreakable. Shyamalan’s best film is (and likely always will be) Signs. The Sixth Sense is important, sure, but unlike other “twist movies” like The Usual Suspects, it lacks any re-watch value once the main conceit has been revealed. There is no more there, sadly. It’s an artifact, something for repertory screenings and film class lectures on the nature of suspense. Signs, however, is his most-fully realized and engaging project. It’s a tightly-controlled and thematically engaging thriller. If making and learning from The Sixth Sense and Unbreakable led Shyamalan to the inspiration needed to make that superior film, then I’ll consider all of this worth it. I hope that’s the case.